We are now accepting submissions for the 2019 Outfest Fusion LGBTQ People of Color Film Festival! 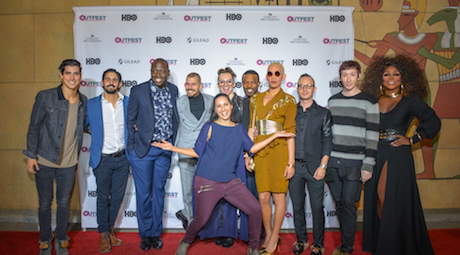 We are now accepting submissions for the 2019 Outfest Los Angeles LGBTQ Film Festival! What kind of films does Outfest Los Angeles screen? Outfest invites filmmakers to submit stories centered around LGBTQ protagonists. We welcome all genres and styles of filmmaking, from emerging voices to established filmmakers. We are agnostic when it comes to format: shorts, features, web-series, music videos, TV episodes are all considered. How many times do films screen, if selected? Generally, the film screenings are one night only events. For films that are in high demand and sell out quickly, we will make our best efforts to add a second screening, depending on the resources available. Which section is my film eligible for? US Narrative Competition: Feature-length, narrative films exploring the breadth of American experiences across race, gender, sexuality, class, geography, and national identity. Los Angeles premiere requirement. Documentary Competition: Feature-length documentaries exploring compelling, character-driven stories from the U.S. and around the world. Los Angeles premiere requirement. International Narrative Competition: Feature-length, narrative films from around the world showcasing the universality and depth of the LGBTQ experience across the globe. Los Angeles premiere requirement. Short Film Competition: Emerging and established stories in short film form. No premiere requirement, but Los Angeles premieres are preferred. Platinum: Dedicated to experimental film, media and live performance that pushes the boundaries of cinema. Notoriously edgy, confrontational, and adventurous, Platinum celebrates the visionaries and renegades of queer art and culture. Los Angeles premiere requirement. Special Events: Bringing the best new TV content to a queer audience, as well as providing a public platform for LGBTQ community leaders to discuss important and timely issues. Also includes panels and workshops. Do you accept work-in-progress (WIP) films? Yes! You can submit rough cuts and works-in-progress, as long as you can guarantee they will be finished by our Print Traffic deadlines. Please make sure you note that your submission is a rough cut and specify what is missing (e.g. temp sound, needs color correction, ADR pickups, further editing, etc.) in a title card at the beginning of your screener. While sound mixing is not necessary, please be sure your film is audible. We are only able to evaluate one version of each film, so please make sure you are reasonably happy with your film when you submit. Can I submit a trailer instead of a WIP or a completed film? No. We will not be able to consider your film if you only send a trailer or clips. What if my online screener does not play? Please make sure your online screener is working and the film plays all the way through and is audible. It is also essential you do not change your password if you are sharing a Vimeo link. While we will do everything we can to make your film work, it is your responsibility to submit a functioning and accessible screener. What is your preferred format for submissions? All films must be submitted digitally. Our preference is password-protected Vimeo links over Withoutabox’s proprietary online screeners. We do not accept DVD screeners. Can I submit more than one film? You may submit more than one film as long as each film meets the eligibility requirements. Each entry must be submitted separately with a separate fee. When and how will I know if my film has been selected? All filmmakers will be notified of our decisions by the end of May 2017. Please make sure the e-mail address on your application is operational and the best way to reach you during this time. This is a very busy time for us, so we appreciate your patience as we deliberate. If you have not received any notification by early June, please e-mail programming@outfest.org. If my film is not chosen to screen during your Festival, can you give feedback on your decision? Unfortunately, due to the large volume of submissions, our programmers cannot offer individual critiques. Additional questions regarding submissions may be directed to programming@outfest.org.